In his little 12 by 12 foot monastic cell Father Pellegrino Ernetti greeted Father Francois Brune one afternoon in the early 1960's. The two men had just met for the first time the day before during a ferry ride across Venice's Grand Canal. During their short conversation, Father Ernetti had said something that stuck in Father Brune's mind. The two, who were both experts on ancient languages, were talking about scriptural interpretation when Father Ernetti remarked that there existed a machine that could easily answer all their questions. Father Brune was puzzled about what kind of machine could do such a thing and resolved to bring it up again with Father Ernetti in that day's meeting. When asked about it, Father Ernetti described a device he called a "chronovisor" that looked a bit like a television. 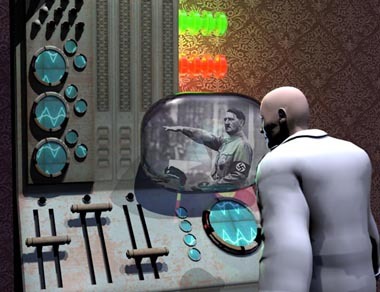 Instead of receiving broadcasts from local transmission stations, however, the chronovisor could tune into the past to allow the viewer to see and hear events that had occurred years or even centuries earlier. Father Ernetti told Brune that the machine worked by detecting all the sights and sounds that humanity had made that still floated through space. Father Brune wanted to know if Father Ernetti and his collaborators had been able to see the crucifixion of Christ. Ernetti replied, "We saw everything. The agony in the garden, the betrayal of Judas, the trial - Calvary." 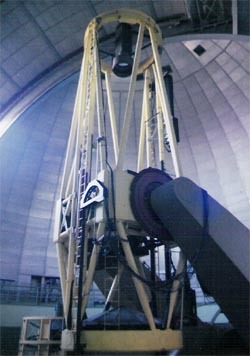 Telescopes, like this large one at the Lick Observatory, can see back in time millions and even billions of years (Copyright Lee Krystek, 2009). We actually use crude versions of chronovisors every day. A security camera hooked to a video recorder will enable us to see into the past. Even something as a simple as mirror is really a type of chronovisor. We don't see ourselves in the mirror as we currently are, but as we were just a few millionths of a second before: the time it takes the light to travel from our face to the mirror, reflect off and return to our eyes. Large telescopes also act as chronovisors. The distant galaxies we view through these devices do not actually look like they are today, but as they appeared when the light left them millions, or perhaps billions of years ago. If an alien scientist on a planet one-hundred light years away had a powerful enough telescope that he could view activities on Earth he wouldn't see recent events, but life as it was a century ago. He would see the Wright Brothers invention of the airplane, not the launch of a space shuttle. If it is possible to see into the past of a distant galaxy using a telescope, why can't a device be built that would allow us to peer into history here back on Earth? How did the priest get a hold of such a fantastic machine? According to what he told Brune, he had been working with a Father Agostino Gemelli at the Catholic University of Milan trying to filter harmonics out of Georgoian chants when they heard the voice of Gemelli's late father speaking to them on the wire recorder they were using (Gemelli later confirmed this incident). This got the priest thinking about what happened to all the sights and sounds humans make. Did they disappear completely or do they continue to exist in some way? Ernetti approached some eminent scientists and assembled a team to work on the project. The group inclided Enrico Fermi (one of the designers of the first atomic bomb) and Wernher von Braun (the German rocket scientist). 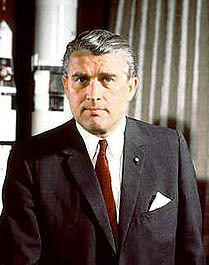 The German rocket scientist Wernher von Braun was a part of the chronovisor team, Father Ernetti told Brune. Brune was astonished that he had not heard of the invention of this device. "Why hide such a discovery?" he asked. Father Ernetti replied that the team had decided to voluntarily dismantle the device. Since it could tune into any place at any time in the past it left no room for privacy. In the wrong hands, Ernetti said, it could create the "most fearsome dictatorship the world has ever seen." The play Thyestes was written by Quintus Ennius who was born 239 B.C. in what is now Calabria, Italy. Ennius is sometimes called the "Father of Latin Poetry" and over the course of his lifetime he wrote about 20 plays and an epic poem on the history of Rome called Annals. Only a few fragments of his work survive. His last play Thyestes was produced only shortly before his death in 169 B.C.. Scholars have wondered about this play for centuries. Though they know what the story was about based on the writings of the first century author Seneca, the actual text, except for a few lines, has been lost to history. Sometime in the late 60's a Professor Giuseppe Marasca became interested in the stories he was reading about Father Ernetti and his machine. Marasca contacted Ernetti and eventually they became friends. Ernetti promised to show Marasca his machine, but never did. What he did present to the professor was a handwritten manuscript of what he indicated was the complete play, Thyestes, that he had supposedly copied down while watching the chronovisor. Marasca held onto the text for a number of years, refusing to show it to anybody. Eventually he passed copies to select individuals including Father Brune. A second piece of evidence that Father Ernetti released was a picture of Christ's face while he was on the cross, apparently photographed through the chronovisor. The photo shows the face of a bearded man with upturned eyes. It wasn't long, however, before someone noticed that the picture was identical (except being reversed left-to-right) to one sold at the Sanctuary of Merciful Love in Collevalenza, Italy. The photograph shows a wooden carving of Jesus in the sanctuary by the Spanish artist Cullot Valera. As for the manuscript of Thyestes that he said he had transcribed from watching the play on the chronovisor, it seems too short - only 120 lines - for it to be the full play. Most plays of this type would have been ten times as long. Dr. Katherine Owen Eldred of Princeton University, an expert on the play who translated the manuscript for the American edition of the book Father Ernetti's Chronovisor, suspects that isn't authentic. Many of the words used in this manuscript didn't appear in the Latin language until over two centuries after the play was first performed. The type of words and the way they are repeated also suggest that the person who composed the manuscript had limited skills in Latin. As Ennius, the playwright, was using his native language this seems very strange. This makes one wonder if the author wasn't Ennius, but Father Ernetti himself. After the Father's death the editors of Father Ernetti's Chronovisor received a document from someone claiming to be a relative of Ernetti but wishing to remain anonymous. The document tells of how this relative was called to Ernetti's deathbed and the priest confessed that he had made up the play and falsified the picture. However, Ernetti continued to insist that the chronovisor actually worked. Since the document is anonymous it is hard to know how much faith to place in it. Father Brune, Ernetti's long time friend, believes that the chronovisor existed, but Ernetti came under pressure from his superiors in the last years of his life not to talk about it. Brune thinks the resemblance of the picture to the statue can be explained by the artist carving the work under the direction of a nun who had a vision. In the vision she saw Christ hanging on the cross and described it to the artist. The artist translated her vision exactly into the sculpture. The sculpture and the photo look alike because they both are true representations of Christ's face. One coming to us via the chronovisor, the other through the nun's vision, suggested Brune. We may never be able to prove that the story of Ernetti's chronovisor was false, but with our technical capabilities expanding continually might it be possible to someday build such a device? Trying to gather the remnants of electromagnetic waves left over in the environment and reassemble them into a coherent image seems an overwhelming task, even with the most advanced computers. Some scientists have speculated, however, that we may find past sounds preserved in the environment. They've even given this speculative branch of science a name: Paleoacoustics. The idea is that sound waves might have been recorded and preserved by accident. One possible way this could happen would be during the creation of pottery. In theory, a clay vessel spun on a potter's wheel and given a spiral pattern with a stylus would act like a primitive phonograph. On early phonographs, sounds were preserved by using a tin (or later wax) cylinder spun with a needle, etching a spiral groove down the surface of the cylinder. The needle would pick up sounds waves and etch the vibrations into the grooves. When the needle traveled down the groove a second time, the effect would reverse itself and the needle would vibrate, playing back the recorded sound. Still, if these techniques are successful they would still be a far cry from Ernetti's chronovisor which could tune into the past at any place or time. Will we ever be able to build a machine like he described? Only time will tell. Father Ernetti's Chronovisor : The Creation and Disappearance of the World's First Time Machine by Peter Krassa, New Paradigm Books, 2000. Acoustic Recordings from Antiquity by Richard G. Woodbridge III, Proceedings of the IEEE, Vol. 57(8), August 1969.